Someone I know is cutting! | KIN & KiDS Marriage, Family and Child Therapy Center. Someone I know is cutting! It can be scary to discover that someone very close to you is deliberately hurting herself/himself by engaging in self-injurious behavior. And you might wonder why would someone do that? Deliberate self-harm (also known as self-injury) is defined as direct injuring of one’s own bodily tissue without suicidal intent. Common forms of self-harm include cutting, burning, self-hitting, skin picking, biting, and banging one’s head. Pain is inflicted to deliberately hurt themselves without trying to kill themselves, although it is possible for some self-harmers to also struggle with suicidal thoughts and behaviors. While the prevalence data of self-harm in Malaysia is not available, a few studies conducted in other Asian countries showed statistics consistent with Western Countries, whereby up to 20% of high-school students and up to 40% of college students have self-harmed. Despite the alarming prevalence rate worldwide, self-harm remains misunderstood and in many countries, a social taboo. 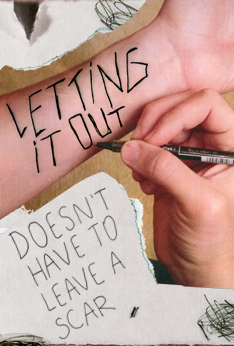 Most people who self-harm are trying to cope with their lives, not end them. Self-harm expresses intense emotional distress that cannot be described in words. Visible damage on skin represents their pain more completely, vividly and concretely than words could, and helps to self-harmers to cope with and alleviate that pain. Self-harm distracts emotional pain with physical pain. The sight of tissue damage or blood grabs their attention and takes attention away from what was upsetting. Self-harm releases overwhelming tension and negative emotions like a pressure cooker valve. Self-harm relieves feelings of intense guilt and shame, by absolving them from all the things they believe they have done wrong and for which they deserve to be punished. Self-harm ends episodes of dissociation or ‘numbness’. It brings attention back to the present when experiencing dissociation (being disconnected from the present moment, body & surrounding) and the physical pain incurred makes them feel ‘alive’ again. Self-harm communicates to “someone” the true extent of their pain, even though it is likely done in secrecy. In the short run, self-harm can lead to people feeling better, calmer and more at peace with themselves. However because the life stressor or problem remain unsolved, when the painful feelings return, one would feel the urge to hurt themselves again in the hope of gaining the relief once felt. They are likely to keep what they’re doing secret, due to feelings of shame or the expectation that others would not understand. Furthermore, feeling ashamed for self-harming increases emotional pain, making a self-harmer more likely to self-harm again. This becomes a vicious cycle with increasing and deeper cuts over time, and in the worst case scenario, could lead to accidental suicide. Identifying alternative coping strategies can stop self-harm. One of the best ways to stop self-harm is to figure out what self-harm does for the person and the purposes it serves, and then find other ways of getting those needs met. This is typically done in treatment with a therapist. Taking self-harm away without giving a substitute that meets the original purpose can be fatal. Instead, people who self-harms need to learn other ways to cope with the emotional distress, to understand and express feelings as well as to communicate with other people in a healthy way. Stopping self-harm is a careful process which requires time and patience, and is best done with the support of a mental health professional. It can be frightening when someone you know shows up with scars, marks, bruises, or cuts on his or her body. Family members and friends often do not know how to respond to self-harm, and often, react in a way that exacerbates the emotional turmoil and distress. Part 2 of this article will describe helpful ways for parents, family members and friends to respond to those who self-harm so that they do not feel alone and isolated in their struggles, but connected and supported while they receive professional treatment. Gratz, K. L. & Chapman, A. L. (2009). Freedom from Self-Harm: Overcoming Self-Injury with Skills from DBT and Other Treatments. CA: New Harbinger. Hollander, M. (2008). Helping Teens Who Cut: Understanding and Ending Self-Injury. CA: Guilford Press. Klonsky, E. D. (2007). The functions of deliberate self-injury. A review of the evidence. Clinical Psychology Review, 27, 226-239. Klonsky, E. D. (2009). The functions of self-injury in young adults who cut themselves: Clarifying the evidence for affect-regulation. Psychiatry Research, 166, 260-268. Thompson, H. K. & Hasking, P. A. (2009). Reviewing Self-Injury: Implications for the study of self-injury and suicidal behavior in Malaysia. Jurnal Sains Kesihatan Malaysia, 7(2), 1-27. Su Chen is a Licensed and Registered Counselor who focuses on working with teens and children at KIN & KiDS. She is currently her final year of her doctoral studies in psychology at Monash University, Malaysia and doing her dissertation on self-injury among college students. Read more about her here.